Happy Friday everyone! Spring has inspired me to do some extra cleaning lately. 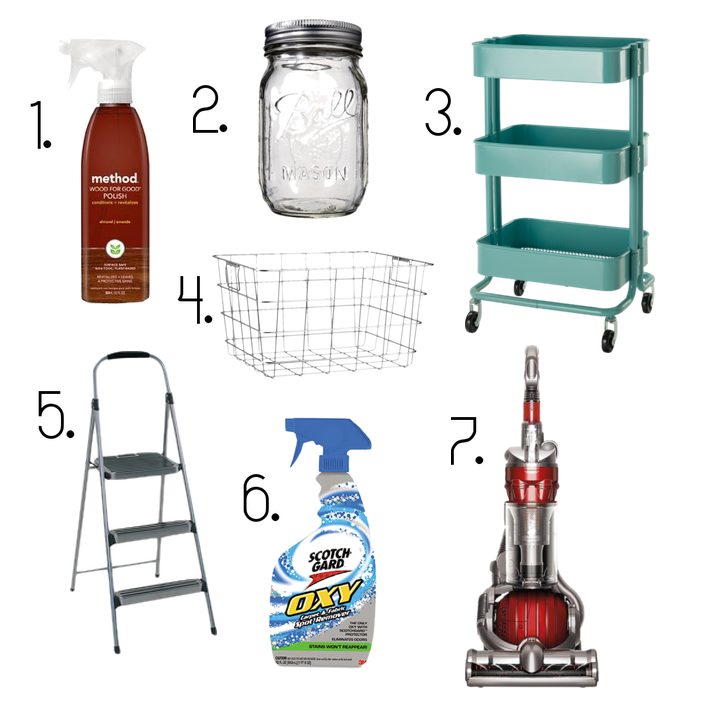 Here are a few of my cleaning (and organizing) favorites! 1// Method Wood for Good Polish// This stuff keeps wood surfaces looking hydrated without any kind of residue. Plus, it leaves behind a great almond/cherry scent! 2//Glass Jars// I use jars all over the house for storing and organizing. In my home they hold everything from dry goods, to clothespins, to makeup brushes. 3// Ikea Kitchen Cart// I’ve been drooling over this cart since it came out. Drew surprised me with it this week. I’m using it as a drink cart in the kitchen to organize my cookbooks and all of my coffee gadgets. 4// Metal Wire Baskets// I love the look of metal storage baskets, great for any room of the house! These baskets have fabric liners (sold separately) which are great for keeping items in reach but out of sight. 5// Cosco Aluminum Step Ladder// We weren’t really sure that we needed this when we bought it, but I’m so glad that we did! I use it all the time for reaching items on top of our kitchen cabinets, watering hanging plants outdoors, and cleaning/organizing top shelves in the closet. 6// Scotchgard Carpet and Fabric Spot Remover// Amazing product! Several greasy spots appeared on our carpet, soon after we moved into our apartment. They kept attracting dirt and getting worse. This stuff got the spots out completely and kept them from ever returning! 7// Dyson Vacuum// These things really work! I use it on both carpet and hardwood floors. I vacuum once a week and I’m always surprised at the amount of dirt it can find in our tiny place. Filters are easy to remove and rinse. The vacuum’s wand is quite long, great for cleaning off the ceiling fan, but a bit awkward to use on furniture. love this list! where did you find the wire basket? i’ve been looking for some just like that! These are from Crate & Barrel. I’ve seen them on Amazon as well!